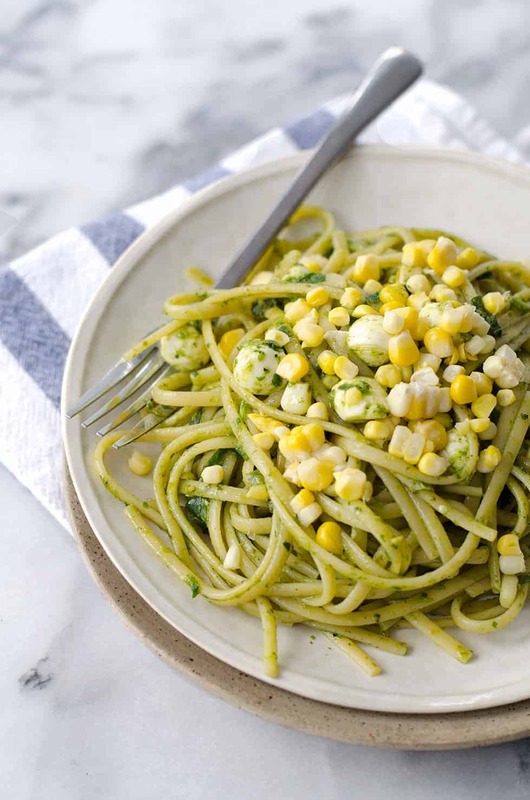 Fettuccini with Arugula Pesto and Sweet Corn- the perfect pasta for summer! Welcome Sun! After days and days and weeks of rain and cloudy skies, I’m so happy to see you again. I was starting to think that BL had moved us to the Amazon instead of St. Louis. Which, by the way, I’m hearing is the norm for this time of year. I’m trying hard not to be such a brat about the weather, but when you’ve lived in bright, beautiful sunshine for the past decade, it’s hard not to be glum when you’re stuck inside again. What to do on a rainy, chilly afternoon in May? Well, that and download as many Photoshop actions as possible. Tell me, do you use these things? I feel like I’ve just been entered into a secret world by discovering these exist. I swear I spent 5+ hours trying on various actions for these photos before finally calling it off and returning to my normal quick editing process. Yes, my priorities are way off. I have a feeling that Photoshop presets are a little like Instagram filters; super cool if you want a moody selfie, but straight-up awful when it comes to food photography. Fellow photography wanna-be’s, if you use these, I wanna know which ones you love! And if this entire section is Greek to you, then I’m sorry. But, at least I brought pasta! Pasta that tastes like summer even if it’s only 50 degrees outside and pouring down rain. If you cook it, maybe it will come? I really love corn. And, even though I try really hard to purchase organic/non-GMO foods as often as possible (mostly for pesticide exposure), I will also happily chomp on a corn of midwestern bred corn. Besides the fact that it’s fairly difficult to find organic corn on the cob around here, I love it’s fat, juicy kernels that almost burst in my mouth with every bite. I blame my husband, who would happily live off of corn-on-the-cob, if needed. Well, that and pizza. So, I added some corn in my pasta and it was divine. I love curling the pasta in my fork and trying to capture as many corn kernels as possible. 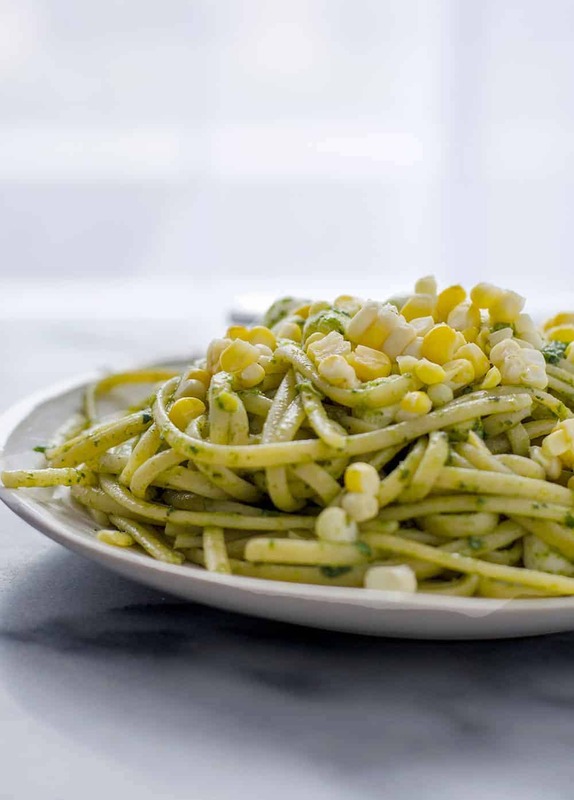 Chewy fettuccini + slightly crisp corn is a fantastic combination. Summer = pesto season, so we’re going with that here as well. I wanted a light pesto sauce, so I omitted any cheese/nutritional yeast that I would normally through in as well as the nuts. Is it still a pesto if it doesn’t contain any nuts and cheese? Herb sauce? It’s got basil in it, so I’m going with pesto. 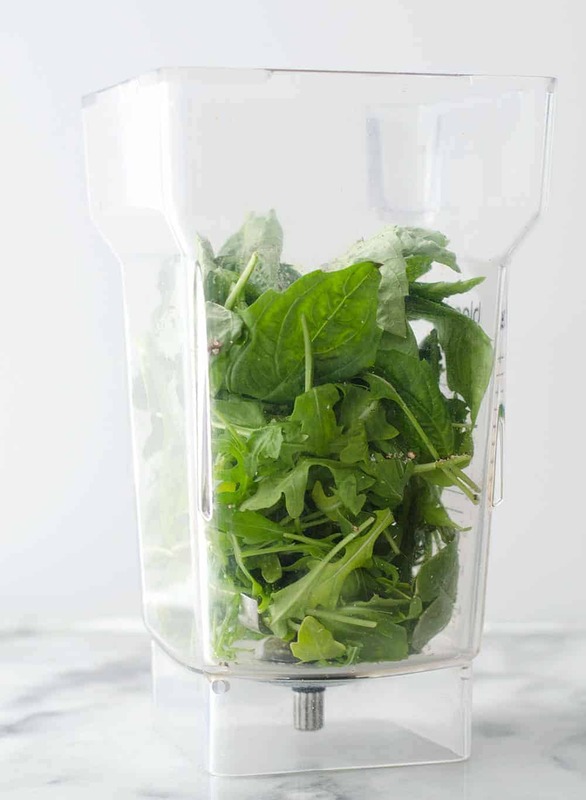 To throw things off, let’s add a bit of arugula. I adore arugula so much and try to sneak it into as many dishes as possible, even though BL hates it. How can you hate arugula? With it’s peppery, spicy bite, it’s fantastic in just about everything. Around here, I like to refer to it by it’s English name, rocket. Much in the same way I like to call zucchini, courgettes. Because, I can. I had a bunch of these mini mozzerella balls leftover from my cooking segment on yesterday’s Great Day St. Louis, so in they went to the pasta. If you’re vegan or dairy-free, feel free to leave them out. Did I mention this dinner is only 9 ingredients? It’s the perfect thing to have on hand when you really don’t feel like cooking, but cheese and crackers for dinner isn’t going to cut it. 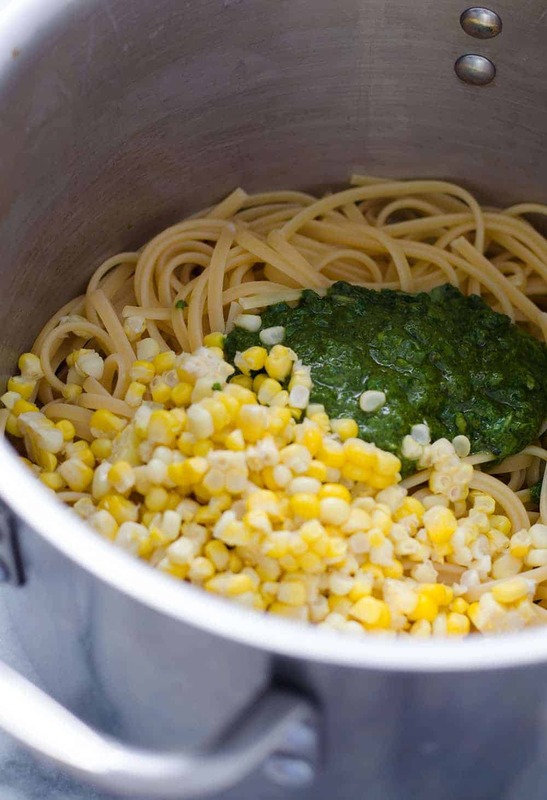 The pesto sauce takes no time to whip up and you cook the corn and the pasta in the same water pot. Can I tell you a secret? I didn’t cook the corn the first time I made it and I actually loved it this way. I think I’m in the minority for those who like raw corn-on-the-cob kernels, but if you do- try it raw! I think this only works with sweet corn, though. Lastly, don’t try this with frozen corn kernels. Since the corn adds so much flavor to this dish, it really can’t be substituted with frozen or canned. I learned this the hard way with my recipe testers in my upcoming cookbook. One of my favorite recipes in there is Corn & Zucchini Gnocchi and I couldn’t wait to hear what my testers had to say about it! When the not-so-great reviews came in, I was shocked. Then, I realized that frozen corn was subbed in for fresh; I tried it that way and it completely missed the mark in terms of flavor and texture. So, it must be fresh. Happy Wednesday! I’m off to do a sunshine dance, and eat more summer pasta. Bring a large pot of salted water to a boil. Add the corn, reduce heat to medium and let cook until tender, about 9-10 minutes. Remove the corn using tongs and when cool to the touch, cut the kernels off and set aside. Bring the remaining water back to a boil. Add the fettuccini and cook until al dente according to package directions. Drain and return back to the pot. 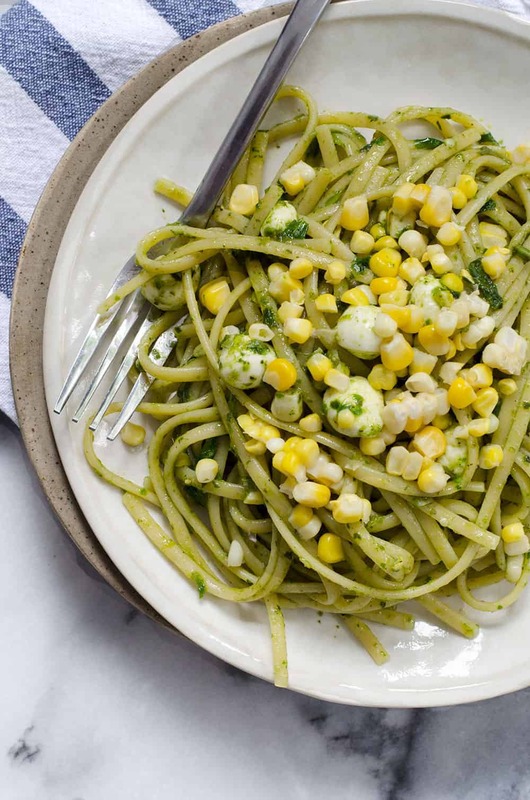 While the corn and pasta are cooking, make the pesto. 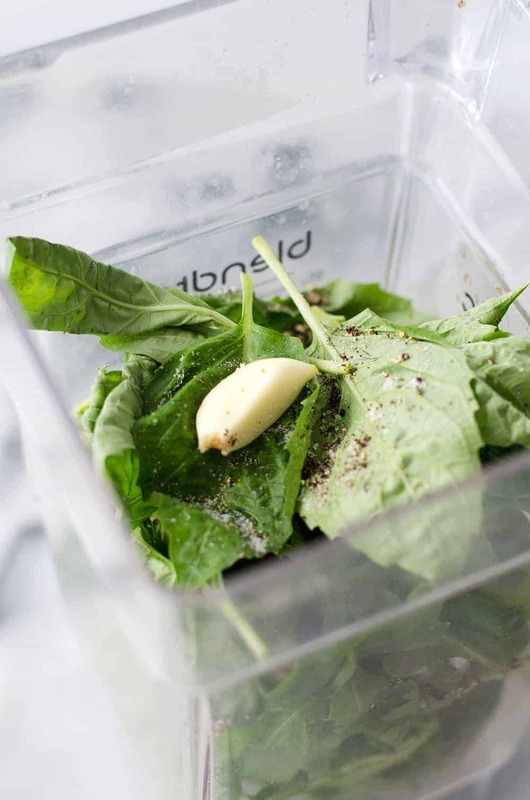 Place the olive oil, arugula, basil, garlic cloves, balsamic vinegar and pinch salt/pepper into a blender or food processor and puree until mostly smooth. 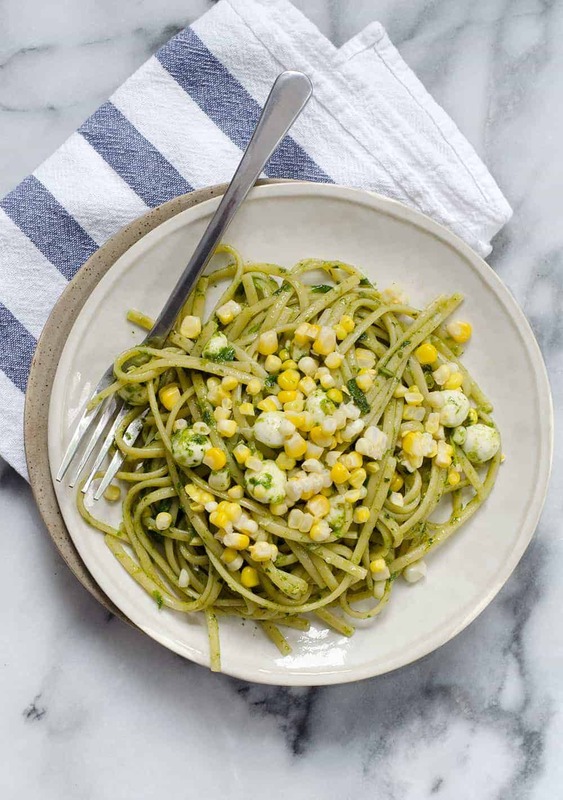 Add the corn kernels and pesto to the hot pasta and toss until combined. Gently stir in the mozzerella balls, if using. I love corn too! I just wish my husband was also a fan of it. The mini mozzarella balls in here also look great. This looks delicious, corn is a summertime staple around here! This is light and lovely, Alex. Love fresh arugula and basil. I wait all year for my fresh Jersey corn <3 So good! The sun has been in and out this week…I just need it to stay! This looks beautiful and so yummy! I just made traditional pesto the other night – but this arugula pesto look so good. Can’t wait to try this recipe. Even though its settling into autumn (finally) down here, I can’t wait to try this soon with some fresh corn from the farmer’s markets. This is such awesome combination of flavours – and I love the mini mozzarella too 🙂 Yum yum!